Root canal therapy is an important dental procedure that saves teeth and successfully eliminates tooth pain. Teeth that are cracked or infected with a deep cavity must undergo endodontic treatment, also known as a root canal. The name of this procedure may make even the toughest dental patient weak in the knees, but under the practiced had of Dr. Chi Fu at Chester Hill Dentistry, you will come to appreciate the many benefits of root canal therapy. Tooth pain does not go away once it has begun, especially in cases where a root canal is the recommended treatment. If endodontic therapy is not performed, bacteria will build up at the tip of the root and the infection of the dental pulp will spread to the surrounding bone. The result? Pain, swelling, and, very likely, tooth extraction. A root canal, quite simply, saves your tooth. During a root canal, the pulp and nerves of an infected tooth are removed. First, an opening is made into the pulp chamber through the crown of the tooth. Once the pulp is removed, the infected area is thoroughly cleaned. A tooth’s pulp and nerve are not important to the health and function of a tooth after it has fully erupted from the gum, making it possible to remove this below-the-surface tooth structure and still save your tooth. 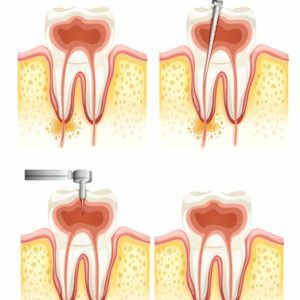 If your Rye dentist decides that it is necessary to complete the root canal therapy in multiple dental visits, a temporary filling will be put in place to protect the tooth. When you return to the dental office, the temporary filling will be removed and the root canal and pulp chamber will be cleaned again and sterilized to eliminate any bacteria. After the root canal has been performed, your tooth will need to be sealed and protected. This is usually done with a porcelain crown but in some cases a permanent filling is used instead. Severe tooth pain while chewing. Tooth pain so severe it wakes you up at night. Extreme sensitivity to hot or cold. Swollen gums in the infected area. Teeth can become infected for any number of reasons, including decay, untreated cavities, chips, cracks, and trauma. If you have tooth pain, don’t try to hold out and hope that it will correct itself. A tooth that is deeply infected will only get worse and cause bigger oral health problems. Root canal therapy has a high rate of success. Teeth that undergo endodontic therapy, once saved and sealed, can last a lifetime. 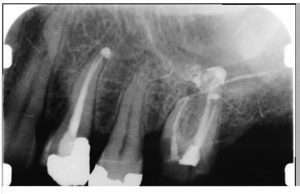 The placement of a crown over your infected tooth makes it hard for anyone to notice that you underwent root canal therapy. If you are suffering with a painful tooth or suspect that you have a tooth infection, contact Dr. Fu at Chester Hill Dentistry to schedule a consultation. Our dental office serves the residents of Rye, Westchester, Rye Brook, Port Chester, and surrounding areas, including Greenwich, CT.